INCLINE VILLAGE, Nev. — Wildlife wardens killed a 3-year-old male black bear overnight at Lake Tahoe after it entered the home of a 92-year-old woman who left her garage door open, an official confirmed Friday. Shortly before midnight Thursday, deputies with the Washoe County Sheriff’s Office responded to a call of a bear inside a residence on Miners Ridge Court in Incline Village, said Chris Healy, spokesman for the Nevada Department of Wildlife. The 350-pound bear got inside the home after entering through the open garage, Healy said. The woman — the only person inside — came across the bear as she descended a staircase in a motorized wheelchair. She left and phoned the sheriff’s office from a neighbor’s home. An NDOW biologist and game warden arrived around 12:35 a.m. Friday, Healy said, and as the bear was trying to exit out a second-floor window, the warden shot it with a tranquilizer. After a dog treed the bruin, it fell out of the tree after succumbing to the dart. An NDOW official later shot the bear dead. “It was euthanized because the bear was a dangerous bear,” said Healy, adding that the bear had not been handled before by the department. 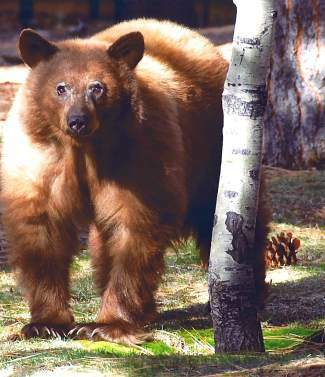 Typically, NDOW operates on a three-strike rule for nuisance bears. Once captured, a bear is tattooed and tagged and given a “strike” — three strikes and it’s killed. The bear’s body was taken Friday morning to a local taxidermist to be skinned out, Healy said. “This is an unfortunate incident, because we really want people to be cognizant that we’re living in bear country, and we need to be aware that we can unknowingly be inviting bears or other wildlife in our homes … and sometimes we do when we leave doors open and windows open and things like that,” Healy said. Ironically, the incident occurred just hours after a five-agency partnership comprising NDOW, U.S. Forest Service, California State Parks, California Department of Fish and Wildlife and Tahoe Regional Planning Agency issued a public service announcement about being “bear aware” at Lake Tahoe. In it, officials ask people to practice proper food storage and trash disposal, a message that’s especially important considering the expected influx of thousands of visitors coming soon to the Tahoe region for Memorial Weekend. There are an estimated 10,000 to 15,000 American black bears living in the Sierra Nevada, according to the agencies. According to the PSA, to report bear conflicts in California, contact Northern California dispatch at 916-445-0380. To report conflicts in Nevada, contact NDOW at 775-688-BEAR (2327). If the issue is an immediate threat, call the local sheriff department or 911. However, for residents looking to avoid a potential situation of an unknowing wayward bear being tranquilized or killed, residents may choose to call the nonprofit BEAR League at 530-525-PAWS (7297). The Homewood-based nonprofit will send volunteers to the scene to employ non-lethal tactics to get the bear to leave. Learn more about the BEAR League at http://www.savebears.org.